Laura Numeroff grew up visiting the library frequently, spending hours devouring books, and designing covers for her own stories. Her love of reading lead her to want to become a writer when she grew up but things changed when she became a teenager. It was then that she thought it sounded more fun to be a fashion designer like her sister. However, she quickly found out in college that this was not the path she should traveling down. Luckily, during her last semester before graduation she took a course in children's writing and illustrating. She wrote and illustrated the book, Amy for Short, for a class assignment. It was quickly published in 1975 before she graduated. This entry into the field of children's literature was very similar to Dav Pilkey, author of the Captain Underpants Series who also wrote his first book while in college. Most of her books before If You Give a Mouse a Cookie are currently out of print, however, Beatrice Doesn't Want To was recently rereleased with new illustrations. We enjoyed reading this book about a dog that doesn't like books, but she is forced to go to the library for three days with her brother while he works on his dinosaur report for school. I had originally planned on making the focus of Numeroff's birthday celebration around the New York Times Bestsellers from the "If You Give a"series. I thought I would have an activity of baking cookies, muffins, pancakes or cupcakes after reading one of the books (I probably will still do this - I love cooking with my kids). However, I received positive feedback on the sibling rivalry activity I did with my kids to celebrate Todd Parr's birthday and I decided to take this post in a different direction. 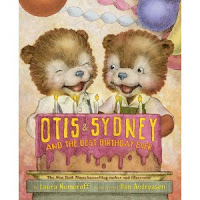 Laura Numeroff has a series of books that could be called "What Our Family Does Best". The books are unique in that they are 2 books together, with one starting in the front of the book and the other from the back. The first book in the series was What Mommies/Daddies Do Best. There is also What Aunts/Uncles Do Best , What Grandmas/Grandpas Do Best , and What Sisters/Brothers Do Best . The illustrations are by Lynette Munsinger who also did the new illustrations for Beatrice Doesn't Want To and two of Numeroff's newer books about a group of friends who refer to themselves as The Jellybeans . These books along with last week's successful sibling rivalry activity gave me the idea to do a "What My Children Do Best" Book. I quickly typed up as many positive things about my son and daughter that I could think of, including things they do well and activities we enjoy doing together. On the last page, I ended with "But, best of all _______ is a great son/daughter." I added a few pictures to the pages to make it extra special. The project took me a whole nap time period, but it felt great to read the book with them when they woke up! It was really important to me to stop and tell them how much I appreciate them. Often, I get caught up in the day to day nonsense and forget to focus on what is really important. Every summer my best friend Pat and I would throw a little birthday party for each other. We invited a few kids from the neighborhood including Malcom whom we didn't even like but our mothers made us invite him. Since our birthdays were in the summer, we made it into a pool party! It was an above the ground kind in her very small backyard. Basically, the entire backyard was the pool! But they were the best parties! We decorated what was left of the backyard with crepe paper and balloons. We'd swim until our fingers turned into raisins, played punchball in her driveway, hide and seek, drank lemonade or punch and feasted on a store bought cake with HAPPY BIRTHDAY written in red. Everyone always wanted the flowers because they had the most frosting. One summer I decided to throw Pat a surprise party! I was so excited about my idea. I was going to do all the same things we always did at the parties. I made the invitations, decorated the backyard, and my mother bought a cake! The whole magilla! The day of the party I had Pat's mother take her someplace so she'd be out of the house when everyone came. I waited and waited. Then I waited some more. No one showed up. I started to get really upset when I suddenly realized I wrote the wrong date on the invitations! That meant NO ONE WAS COMING and Pat was on her way home! I hid behind the pool by myself and when she walked into the backyard I jumped up and yelled "SURPRISE"! When I told her what had happened, we both had a big laugh. We ended up playing all the games, but the best part was that we had all the frosted flowers to ourselves! A couple closing thoughts...Thank you so much to Laura Numeroff for sharing her birthday memory. My kids were so excited to hear from you (My daughter said, "She is the awesomest author ever!"). Check out the Reading Rainbow episode below featuring If You Give A Mouse a Cookie, it is a great episode. My kids' favorite book by Laura Numeroff is Dogs Don't Wear Sneakers . I really enjoyed checking out books by Laura Numeroff that I hadn't read before including Sherman Crunchley , Why a Disguise? , and Would I Trade My Parents? If You Give a Mouse a Cookie from WVPT on Vimeo. I had no idea that the book, If you give a Mouse a Cookie, was 25 years old! Thanks for sharing all of that information! What a fabulous coincidence! It's so funny that I had her book featured today and it's her birthday. We just love everything she writes, especially my son. But actually even my sister had such adoration for the Mouse that we traveled quite a ways for a book signing when I was much younger. So much fun! She is one of our favorite authors in my home! Those books are the best! Very nice website. I love to see great children's literature highlighted and I love a site that makes the internet a better place. I look forward to reading more in the near future. I also loved the post on E.B. White. Who does not love Charlotte's Web.